My favorite item she made was the two-headed doll. It wasn’t creepy at all though it sounds like it. The heads were not side by side but were at opposite ends of the doll’s torso. By turning the doll upside down and pushing her nightgown over one of the heads, an awake or asleep girl was revealed while the other remained hidden under the gown. 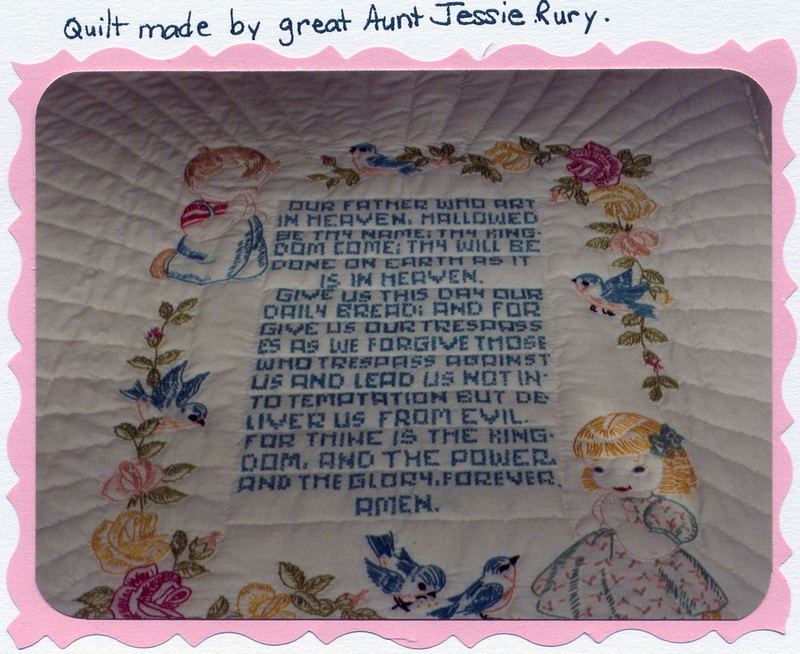 My great Aunt Jessie made everything on it; the hair was made from yarn, as were the blue eyes and the nightgowns plus there was a matching doll-sized quilt. Using my new Polaroid camera, my Dad snapped a photo of me with my new, handmade, two-headed doll and quilt. I frequently examined the doll noting the precision of work and displayed the doll on my bed from the time I got it until I was in my late twenties. My 18-month-younger cousin and I seemed to frequently receive hand-sewn or quilted Christmas gifts from her. Aunt Jessie mailed the packages from her home in Roswell, New Mexico to her sister’s house, my Grandma, so that we had very cool, handmade items to unwrap and enjoy throughout the years. I’m pretty sure that each of my cousins received something handmade from her. I know that when my brother was born she gave him a handmade baby quilt with the Lords’ Prayer done in needlework and cross stitch. She must have learned her sewing and quilting skills from her mother who was known to be quite the expert seamstress. Jessie and Alfred N. White married in Phoenix, Arizona in 1930 and though they had no children they were married until about 1939. Growing up I never realized that she had married as she went by her maiden name. I do not know if they divorced or what happened. 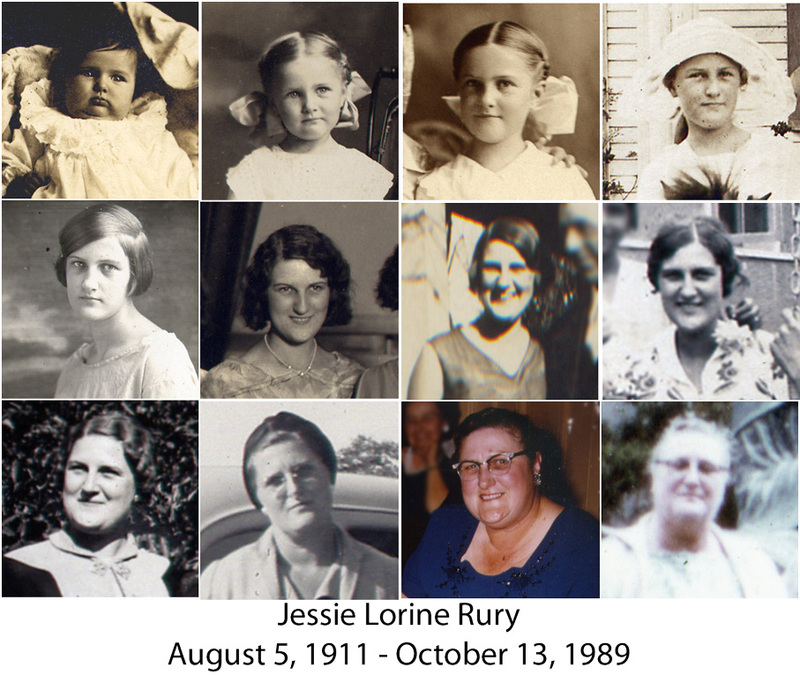 Today, I’m remembering my paternal grandmother’s sister, Jessie Rury. Again, I love the photo collages. I’d forgotten the doll, so it was nice to read the story of it and how long you kept it displayed.